For survivors of colorectal cancer, struggles can include negative body image, persistent gastrointestinal problems and sexual dysfunction—issues that can diminish quality of life and jeopardize relationships. Halloween is supposed to be frightening, but not the way it was for Denise Cesta a few years ago. On that holiday in 2011, she started treatment for stage 2 colorectal cancer. Facing a harsh therapeutic regimen, Cesta worried about how she would hold up physically and emotionally, and how well radiation, surgery and chemotherapy would work against her cancer. “It was one of the scariest days of my life,” she recalls. Since then, Cesta has joined the ranks of long-term survivors of the disease—and that has created a new set of challenges. Recent research has shown that, although the overall incidence of colorectal cancer is decreasing, rates are increasing in young adults, and this group faces particular challenges, including dating and discussing life after cancer with their children, especially if they have a genetic predisposition. And survivors of colorectal cancer face a risk of disease recurrence, secondary cancers or comorbidities such as cardiovascular disease, musculoskeletal problems, lung or breathing problems, and depression. Of course, adhering to a recommended schedule of screenings and follow-up visits with health care providers can make a big difference in how patients fare after colorectal cancer. But there is more survivors can do to improve their quality of life, from joining support groups to pursuing a healthy lifestyle. Studies suggest that a diet low in red meat and fat, along with an exercise regimen, can help prevent recurrences and comorbidities among survivors of colorectal cancers, and can promote a sense of well-being. 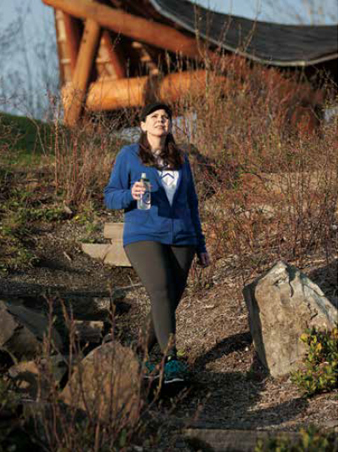 After being treated for stage 2 colorectal cancer, Denise Cesta started a vigorous exercise regimen. Photo by Sy Bean. “There is increasing evidence on how lifestyle factors may impact outcomes for survivors, including being physically active, maintaining a healthy diet and maintaining healthy levels of vitamin D,” explains Jeffrey Meyerhardt, lead author of the 2013 clinical practice update to the American Society of Clinical Oncology’s (ASCO’s) guidelines on follow-up care for survivors of colorectal cancer. It’s a mindset Cesta has fully embraced. She’s added more whole foods to her diet, pursues holistic therapies like acupuncture, acupressure and massage, and has adopted a new fitness regimen. For people like Cesta, diagnosed at a time when earlier detection and improved treatments are making their mark, the prospects are better than ever, and the majority of patients with local or regional disease will be cured. Although colorectal cancer remains the second leading cause of cancer death in the United States, nearly two-thirds of patients remain alive five years after diagnosis, and for the 75 percent of patients whose cancer is detected at an earlier stage, the fiveyear relative survival statistics are even better: nearly 90 percent for patients with localized disease and 70 percent for those whose cancer has spread to regional lymph nodes. That’s good news for patients, but those statistics didn’t do much to soothe Cesta when she started her treatment, a grueling regimen involving nearly six weeks of daily chemoradiation, then resection and ileostomy surgery, followed by another round of chemotherapy. To make matters worse, the day she received her first treatment, her husband landed in the intensive care unit with pneumonia and a collapsed lung. How did she cope? Part denial, she says, and part just going through the motions. As a project manager for a small health care communications firm in metro Seattle, Cesta explains, “I just went into project management mode.” She adhered strictly to her treatment schedule, continuing to work on her laptop during four-hour infusion treatments. She missed work only after her resection and ileostomy reversal surgeries (for five weeks each time), and, she admits, that was the hardest time. Colorectal cancer also took a toll on her relationship with her husband, who had lost his mother to cancer when he was 25. “It was all very raw. We weren’t connecting and communicating. Cancer can bring some couples closer together, but unfortunately for us, it drove us apart.” The two separated for eight months, but have since reconciled. Despite that arduous journey, Cesta now sees that chapter in the rearview mirror as a speed bump on her journey. She says that her relationship with her husband was ultimately enriched by the experience. She is refocused on what is important in life and has emerged proud, strong and devoted to a healthy and active lifestyle—an approach experts agree is crucial to living well as a colorectal cancer survivor, along with vigilant surveillance and regular, robust communication with health care providers. Prevention of recurrence is the most important consideration after treatment ends, especially during the first five years, when the risk is highest. On its Cancer.Net website for patients and caregivers, ASCO provides a five-year schedule for follow-up blood tests, screenings (including CT scans and colonoscopy), and regular physician examinations based on the patient’s cancer stage (http://tinyurl.com/numkgqd). This period is a critical (and worrying) time for cancer survivors, and careful adherence to the guidance of their health care teams for follow-up monitoring is important, notes Meyerhardt, clinical director of the Gastrointestinal Cancer Center at Dana-Farber Cancer Institute, in Boston. “Patients with colorectal cancer have surgery and, for those appropriate, chemotherapy, and they’re followed very closely in the clinic every two weeks,” continues Meyerhardt. For some survivors, that’s easier said than done. Fear of recurrence can be stirred up when aches and pains previously associated with a cancer arise; when a relative or friend receives a cancer diagnosis; when cancer is covered by the media; or upon follow-up medical appointments. It’s a fear that can be extremely intrusive. Experts agree it should diminish over time, especially if a patient is having a positive experience as a well person. Still, for some, it can persist with emotional and physical impact. To cope, survivors can try using calming self-statements, imagery and distraction, journaling, or talks with family, friends, doctors or nurses. “The fear of cancer recurring is part of the contract you never agreed to sign from the club you never wanted membership in. Fortunately, this is a manageable and controllable document that empowers you to take ownership of your fear and live your best life possible with and through your disease,” Matthew Zachary, founder and CEO of the nonprofit Stupid Cancer, told CURE for its 8th Annual Cancer Guide. Even without a recurrence, life can change quite a bit after colorectal cancer. Cesta says she has permanent neuropathy in her feet (which in some can be an aftereffect of oxaliplatin therapy, notes Meyerhardt), and the chemotherapy treatments resulted in early menopause. Individuals who have had abdominal surgery are at higher risk of bowel obstruction, she adds—something for which she has been hospitalized three times. “I don’t think my digestive tract will ever be the same as it was before,” she says. The bowel issues associated with colorectal cancer represent an understandably sensitive topic for patients and survivors, and Cesta says that joining a support group and participating in online forums can help. Cesta occasionally attends a Living with Colorectal Cancer support group near her home, which meets monthly under the auspices of the Seattle Cancer Care Alliance. She also participated in “Colon Talk,” a colorectal cancer support forum of The Colon Club. “When I was going through treatments, I wasn’t a very active poster,” she says, “but I would read others’ posts, and it really helped me to know what to expect.” Recent topics and questions posted to the forum include abdominal distension following surgery, diet recommendations to address bowel issues, and anxiety over follow-up scans. Nurse practitioner Zana Correa, who since 2007 has been providing care to and supporting colorectal cancer survivors through Memorial Sloan Kettering Cancer Center’s Adult Survivorship Program, agrees that such interactions can be really helpful in addressing the psychosocial issues, such as depression and fear of recurrence, that may accompany a colorectal cancer diagnosis. With a social worker, she co-facilitates a Life after Colorectal Cancer support group at Sloan Kettering where such issues can be freely discussed. Correa provides advice on the management of bowel dysfunction by advising on the use of fiber or anti-diarrheal medications, dietary changes and pelvic floor strengthening as needed. In addition, she makes referrals to an onsite dietitian-nutritionist, a tobacco-cessation program if the patient is a smoker, or to other specialists who can help manage late effects of treatment. “Stress management is key,” says Correa. Along with recommending support groups, she refers survivors to Sloan Kettering’s Integrative Medicine Service for touch therapies, mind-body therapy or acupuncture. Survivors treated for cancer at smaller facilities may not have such services on their doorsteps, meaning that communication with their health care teams is especially important. Survivors should not be afraid to ask questions and take notes, so that they can learn about important lifestyle factors and identify reputable resources for information and support. Survivors should also encourage the members of their health care teams to communicate with one another. After her treatment ended, Cesta determined to live the healthiest lifestyle she could. She signed on to Livestrong’s “Survive & Thrive,” a 12-week program involving a personal trainer and other survivors that helped her to get back into an exercise routine. She took her fitness regimen to the next level by participating in an Athletes 4 Cancer camp, joining survivors on a trip to Maui, where she learned to surf. She says these activities helped her to build confidence and showed her that she could accomplish things she once never thought possible. She continues her focus on fitness today with weight training and exercise and dance classes. In addition, Cesta decided she wanted to help others who are facing cancer. She participates in a number of colon cancer Facebook groups and sponsored walks to raise funds for research. And she is a volunteer buddy for the Colon Cancer Alliance, which matches her with newly diagnosed patients facing issues similar to those she experienced, usually middle-aged women dealing with an ileostomy. “Having this cancer was a wake-up call for me,” says Cesta. “Before I had cancer, I felt I was invincible, and I was just going through the motions of life.” Now, she says, she is in a position to help other cancer survivors live their best life. After her treatment ended, Cesta signed on to Livestrong’s “Survive & Thrive,” a 12-week program involving a personal trainer and other survivors that helped her to get back into an exercise routine. Photo by Sy Bean.